In celebration of Poetry Month, Castle Rock Writers will present “Left Brain, Write Brain” with the poet SETH on Monday, April 1st, 2019, 6:30 to 8:30 p.m. This event is open and free to writers and poets from the Front Range and beyond. Seth will interact with the participants, exploring word play and self-expression. The workshop will take place in the Castle Rock Bank Room East at the Philip S. Miller Library, 100 S. Wilcox Street, Castle Rock, 80104. No RSVP is required. *HOLIDAY PARTY: location to be announced in the fall of 2019. Write-out & Workshop: Plan on writing for an hour. After a short break, writers can take turns reading what they have written or read five pages of a work-in-progress. Bringing a manuscript is not required. New writers may feel more comfortable reading after they get to know the group. –Double-space, Times New Roman, 12-14 points. –Select five pages of your work to read. –Bring six to eight copies for others to follow along and make comments. –Using blank sides of old manuscripts is fine. –Your copies will be returned to you that evening. If Douglas County School District or DCHS is closed due to weather, the meeting is cancelled. If the library is closed, the meeting is cancelled. For more information, contact CRW at 303-521-8615. This workshop focuses on the use of spatial and chronological writing techniques to craft a scene, so the reader may see, hear, taste, touch, and small the setting and experience the mood the author desires to create. Participants will practice techniques to move from the tangible to the intangible. Description: The title is a take-off on the three Rs of grammar school. In this case, they stand for Report, Research and Request. Non-fiction relies on facts, so the 5 Ws and the H–the basics of news reporting, are just as relevant when writing a non-fiction book. Research is essential, and knowing how to get the most out of this discipline involves several points. Request stands for asking questions–the art of interviewing, and it truly is an art. In this session, Dressman will also cover preparing an abstract of the book project. Bio: Denny Dressman concluded a 44-year newspaper career in June 2007, retiring from the Rocky Mountain News in Denver after 25 years. From 1992 to 2001 he was vice president for labor and human resources at the News. He was inducted into the Denver Press Club Hall of Fame in 2008. He served as president of the Colorado Authors’ League, the state’s oldest professional writers organization, ending his term this past June. Author of one book in Cincinnati in 1981, he resumed writing books in 2005, and his ninth book, Beyond The Camps – From Japanese-American Internment Nightmare to ‘American Dream’ was published in April 2018. He is now working on his 10th book, a biography of horse trainer John Parisella. Castle Rock Writers featured Laurel Jean Becker on Monday, July 9, 6:30-8:30 p.m. at the Philip S. Miller Library, 100 S. Wilcox, CR 80104. Becker will lead the workshop “Talking Poetic Turkey.” Learn how to write blank verse, using rhythm without the burden of rhyme; this can improve prose, too. Also learn the villanelle. Come find out what it is—and a simple way to learn this form. No RSVP required. Contact information: www.castlerockwriters.com or 303-521-8615. Novelist Elisabeth Hyde, the author of six critically-acclaimed novels, led the June workshop on “Plot and Character.” Hyde’s most recent book is GO ASK FANNIE, about three siblings coming back to their father’s farmhouse for the weekend. Previous novels include IN THE HEART OF THE CANYON, which was a NY Times Editor’s Choice and a People Magazine Great Read; and THE ABORTIONIST’S DAUGHTER, a best-seller in the UK. Trained as a lawyer, she worked for the U.S. Department of Justice in Washington, D.C., before she started writing full-time. She lives in Boulder with her husband and the best dog in the whole world. CRW learned the basics of plotting a mystery, along with the nuances of mystery genres and everything necessary for a compelling mystery. Thanks to Steve Caswell and the Colorado Poetry Society for hosting our “Poetry Month” meeting on Monday, April 9th. The 20 attendees learned about poet Philip Levine and his take on work, society, culture, and poetry! We had fun trying our hand at writing poems. Description: While the American working class has been in the national spotlight, what about working class poetics? Who writes poetry for these men and women, and what does that verse concern itself with? We’ll look at the work of Philip Levine, one of creators of the genre, and the work of some other writers, before creating our own poems. Looking back…Monthly Workshop for March 2018. Linda Berry’s varied writing credits include short fiction for children and adults, six mystery novels, preschool curriculum, and a newspaper entertainment column. Recently she’s been focusing on short plays, poetry, and performance pieces. She and her husband try to organize their lives around theater tickets. Writers are often told: “Show, don’t tell.” What does that mean? (Essentially, showing is dramatizing, as in a play. Telling is summarizing, as in a synopsis.) In good writing there’s a place for both. We’ll consider when and how you’ll choose to do one or the other to give your writing more impact. Laurie Marr Wasmund, novelist and writing instructor, presented the workshop “Tough Talk: Writing Effective Dialogue.” According to Wasmund, dialogue is a powerful writing tool in any writer’s repertoire. She will show us five ways to develop effective dialogue, including how to use dialogue to ratchet up tension; where to place dialogue “tags;” and how to make dialogue sound realistic to your readers’ ears. LAURIE MARR WASMUND is the author of My Heart Lies Here, a novel of the Ludlow Massacre; Clean Cut, A Romance of the Western Heart; and To Do Justice and To Love Kindness, the first two books of the White Winter Trilogy, set during World War I.
Dr. Michelle Post is a driven, passionate and experienced leader, teacher, social media strategist, connector and national and international speaker. Her desire to connect and inspire throughout more than three decades of career translates into her ongoing effort to help the development of ideas, people, content, and learning. Her passion is to help others to learn how to release their internal gifts for personal and professional success. She believes every person’s life matters and what they do matters too. In addition, every individual has a story that needs to be shared, and The Connection is lucky to have her on their team. Writers must consider several factors when choosing a narrator and point of view (voice). In addition to answering questions such as whom and when, this class explores the narrative choices available to writers, examines a narrator’s motivation, and incorporates practical exercises for both new and experienced writers to experiment with voice. Rick Gustafson is a short story writer and novelist from Denver, Colorado. Rick completed graduate work at the University of Denver, earning a Master’s of Liberal Studies in Global Affairs as well as a Certificate of Advanced Study in Creative Writing. The recipient of the 2014 E.M. Koeppel Short Fiction Award, Rick has also received awards for his short fiction from the Writers-Editors Network (2013), and the Denver Women’s Press Club (2009). His short fiction has also appeared in the Nefarious North Anthology. He has written over 250 news stories and features for several Front-Range area magazines and Colorado Community Media. Exploring tough subjects can be uncomfortable and sometimes controversial; therefore it’s important to know how to speak directly to your readers about real-life concerns without lecturing. Learn how to create powerful and intense situations that are believable and honest, as well as create content that is artistic and critical to the story. Rebecca Green Gasper is an author of young adult contemporary fiction on teen tough issues. Holding a degree in sports medicine and recreational therapy, she has spent many years as a special education teacher working primarily with teens. When not writing, you can find her in the barn with her horses. So you’ve written a book? Congratulations! Now comes the hard part – how to get it on the shelves. In this workshop, I will ‘demystify’ the traditional publishing process by addressing common questions. How does one get an agent? Does one need an agent? What is a query letter? How do I submit to agents? When do I submit to agents? What role does self-publishing play? Getting a book deal from a traditional publisher is extremely difficult, so understanding the process is crucial. Attendees of this workshop will gain an understanding of how to navigate the journey so that their work has a better chance of finding success. Write Hot! Write from Your Core! (bring writing materials or a fully-charged laptop). The essence of Kitchen Table Writing is to allow the pen to guide. Let whatever comes out of your hand, your pen, your heart—hit the page. It is meditative, a time for praise, acknowledgement, gratitude; a time to sort out a challenge, or to describe the tree outside your window or the sky. You are freeing the spirit and letting what needs to come through your subconscious by ink erupt onto the page. allow yourself to be who you are. Anne Randolph, Kitchen Table Writing, inspires writers in Denver and conferences like Screenwriter’s Conference in Santa Fe. This workshop offered suggestions for supercharging the editing/revising process, including when to integrate internal dialogue into the story, how to create direct involvement with your writing for your reader, and more. LAURIE MARR WASMUND has worked as a writer, editor, and community college instructor. She has published short fiction in literary journals and articles on Colorado history in popular magazines. Her first novel, My Heart Lies Here, is a story of the Ludlow Massacre in Trinidad, Colorado in 1914. Her second novel, Clean Cut, is a novel of small-town living in Wyoming. The first novel of her White Winter Trilogy, To Do Justice, chronicles America’s involvement in World War I. Book trailers, similar to movie trailers, are the cutting edge of book promotion. Come learn what’s involved in making a DIY trailer for YouTube and get an overview of this low-cost marketing tool. Award-winning writer Mary Taylor Young is author of 15 books about the landscape and heritage of the West. She has written professionally and taught writing to adults and children since 1987. In 2012, she was a National Park Service Artist in Residence in creative writing at Rocky Mountain National Park. She produced a book trailer to promote her most recent title Rocky Mountain National Park: The First 100 Years. Whether you’re a full- or part-time freelancer, there is good money to be made writing feature articles for business clients. Kevin Corbley, an independent business communications professional for 24 years, walks you through the process of writing a commissioned story and getting it published in an industry trade magazine. Scrivener is the best writing program on the market. Bring your laptop and join novelist and writing coach, Deb McLeod, for an introduction to how she and her clients use Scrivener. PC and Mac versions will be covered. Sara Megibow, literary agent with kt literary agent, spoke on “How to Pitch with Sara Megibow” at the February 2017 workshop.”We will focus on learning to think/talk about a novel concisely. This skill helps writers in pitching, and it also helps writers in identifying the core of their story, a surprisingly important thing to know in the writing AND the selling of a novel,” said Sara. Bio: Grant McKenzie, the “Kilted Writer,” spends his time studying and analyzing story and character development. Using that knowledge and experience, he works with writers—especially novice writers–coaching and mentoring them so they can up their game in story creation. McKenzie writes fiction, poetry, and non-fiction. He is a past presenter at Castle Rock Writers Conference, Colorado Springs Fiction Writers Group, and Parker Writers. He has worked as a developmental editor for three years. Monday, November 14, 2016-–“NanoWriMo” Write Out,” Philip S. Miller Library, Castle Rock Bank Room East, 6:30 to 8:30 p.m. This is open to any writer, whether you are registered for National Novel Writing Month or not! Bring your laptop or a notebook and write for two hours, either for NaNoWriMo or on your own project. CRW will provide the snacks! Castle Rock Writers group hosted W. Terry Whalin, acquisitions editor at Morgan James Publishing, who talked on “The Importance of the Pitch.” This workshop covered pitching your ideas or manuscripts for non-fiction, fiction, Christian fiction, and children’s work to literary agents at writers conferences. Castle Rock Writers group was proud to present author and creative writing coach Deb McLeod, BA, MFA, at its next workshop, Monday, August 22, 6:30 p.m. at the Philip S. Miller Library in Castle Rock. The topic is “Character Transformation by the Beat,” which will help with genre fiction, literary fiction, and memoir. Castle Rock Writers hosted Rick Gustafson who presented “Plotting: Beyond Freytag” on Monday, July 18, 6:30 p.m. at the Philip S. Miller Library. Presenter: Rick Gustafson holds an MLS from the University of Denver and has won several writing awards for fiction including the E.M Koeppel Short Fiction prize in 2014. He is a weekly contributor to Colorado Community Media and works fulltime as a writer. In June, Castle Rock Writers welcomed Laurie Marr Wasmund, editor & book doctor at Lost Ranch Books Editing. adjunct faculty at Arapahoe Community College (English Composition I and II) and former instructor at Metropolitan State University of Denver. She shared the importance of primary resources and secondary resources, illustrating her talk with examples of how she does the research for her own fiction. The participants found her advice helpful and inspiring! Corbley is a public relations specialist who holds a bachelor’s degree in geology from the University of Notre Dame. Right out of college, Corbley worked as a journalist on Capitol Hill in Washington, D.C., covering the oil/gas business. Then he worked in the public relations office of an aerospace company. He started his freelance business in 1993, 23 years ago! The speaker shared the story of how he went from geology major to freelance writer and why he thinks freelancing is great lifestyle. “Most freelancers–whether writers, web designers, or plumbers—fail to understand their success will depend more on their business skills than anything else,” said Corbley. April 2016 Meeting: Author Celebration! CRW heard how other writers made their publishing dreams come true at the April CRW Monthly Workshop. Five authors working in various genres shared how they did it. CRW celebrates Jean Jacobsen (Highland Ranch), Sandy Whelchel (Parker), C.S. and Peter Boddie (Littleton), Maggie Podunovich (Colorado Springs), and Chris Richards (Castle Rock). See their photos and more information below. THANKS FOR SUPPORTING YOUR FELLOW CASTLE ROCK WRITERS! Suggested donation for the meeting is $5 or whatever you can afford. This will help CRW cover expenses for the workshops. Sandy Whelchel: Sandy is the author of four published novels and eight non-fiction books. In 2013, she won the Colorado Authors League Award for Genre Fiction. Her most recent book is Images of America: Parker published by Arcadia Publishing. 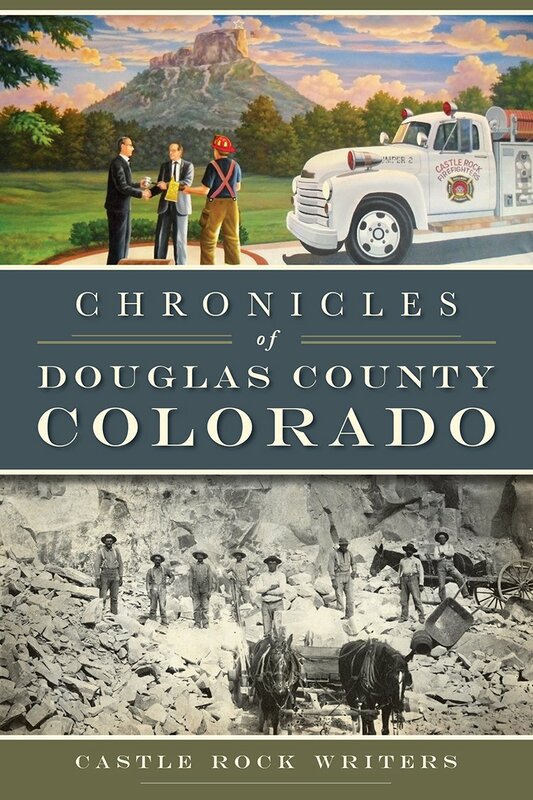 It is an historical overview in photos and text of Parker, Colorado’s development. Sandy is the founder of the National Writers Association, and she is a former faculty member of the Castle Rock Writers Conference. Caryn & Peter Boddie: Peter and Caryn published two books (2014 and 2015), Lost Ski Areas of Colorado’s Central and Southern Mountains and Lost Ski Areas of Colorado’ Front Range and Northern Mountains. The books take the readers on a tour of the lost hills of Colorado where people enjoyed skiing and ski jumping before the big resorts developed. The Boddies are also author of hiking books covering Colorado, published by Falcon Press. They have sold over 100,000 copies. Maggie Podunovich: Maggie is a former flight attendant, who was medically retired after 17 years due to back surgery. In her 30s, she learned of letters her father had written about his life. Since he died when Maggie was six, she and her sister Mary found them fascinating. They believed his beautiful, but painful story should be told. Now it has been, in Maggie’s new book I’ve Been Only a Shadow: Letters from My Father. Maggie is one of the original Castle Rock Writers who banded together in 1999 at the Philip S. Miller Library to learn writing skills and support each other. J. Chris Richards: Chris is the founder of WAY—Words and Youth, conferences for teenage writers. She is a member of Toastmasters International, Words for the Journey Christian Writers Guild, American Christian Fiction Writers, and a former faculty member for CRW conferences. In her debut novel Shattered Trust, she uses her knowledge as a police wife to create suspenseful story about police officer looking for redemption at work and with family. Pam McCutcheon, novelist and non-fiction writer, spoke to CRW on Goal, Motivation, and Conflict. Pam McCutcheon returned in March to speak on Brainstorming for your Work-in-Progress using the basics from the book Goal, Motivation, and Conflict. Mary Taylor Young spoke on “Living the Writer’s Life,” with suggestions for getting organized and setting goals as a writer. Looking Back at 2015 Workshop Leaders! NO JULY WORSHOP: Happy 4th of July! October 5, 2015—Chris Mandeville, “How to Write a Novel in 30 Days!” National Novel Writing Month (NaNoWriMo) is an international phenomenon during which writers attempt to finish a novel in 30 days. November 2, 2015—“Castle Rock Writers WRITE OUT” Here is a chance for NaNoWriMo novelists, along with other writers, to bring ideas, fully-charged laptops, or notebooks to get some writing time. December 7, 2015—CRW Holiday Dinner: Blue Nectar Restaurant, Castle Rock, 6:30 to 8:30 p.m. RSVP to castlerockwriters@gmail.com or AliceAD1951@icloud.com. by Saturday, December 5.